When she announced her resignation Tuesday, outgoing U.S. Ambassador to the United Nations Nikki Haley ticked off a list of her accomplishments, one of which was aimed squarely at stopping Central Africa’s bloodiest conflict. “[In] South Sudan, we got an arms embargo, which was a long time coming,” Haley noted. The U.N. Security Council approved the embargo in July, largely at the pushing of Haley, who visited South Sudan in 2017 and saw the devastation caused by the five-year civil war with her own eyes. Emira Woods, an advocate with the group Africa Rising for Justice, Peace and Dignity, says Haley showed strong leadership at the U.N. regarding South Sudan. “There were many areas in which it seemed like the State Department was being hesitant or less bold than many would have liked, and South Sudan and its arms embargo is one of those examples where leadership is needed, and she used the sort of bully pulpit of the U.N. effectively in those areas,” Woods told VOA’s South Sudan in Focus on Wednesday. Samantha Power, the U.S. ambassador to the U.N. during the Obama administration, tried and failed to get the Security Council to pass a similar embargo on South Sudan. A report released this month estimated that the civil war in South Sudan has caused 382,000 excess deaths, half from violence, half from disease and malnutrition. President Salva Kiir and rebel leader Riek Machar recently renewed a 2015 peace deal that observers hope will finally end the conflict. Haley, a Republican, served as the governor of South Carolina for six years. She has been one of the few high-ranking women in the Trump administration. 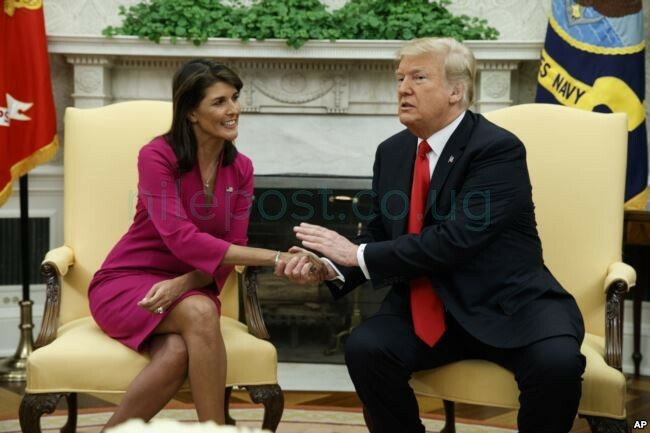 Even though she had frequently criticized Trump early in the presidential campaign, Trump appointed her U.N. ambassador within weeks of becoming president. While serving as ambassador, Haley has been a steady, outspoken critic of corrupt leaders around the globe and was highly regarded by foreign diplomats who looked to her for advice on how to deal with the Trump administration. “I think the announcement of her departure took many people by surprise. There is a sense that the White House has had very few women in its Cabinet and for one of the women to be leaving so suddenly comes as a shock to many,” Woods said. Haley flatly denied she is leaving for personal reasons or to run for president in 2020, noting she has served the country for eight years. Trump said he expects to announce Haley’s replacement within two or three weeks.